Femi Fani Kayode has left no stone un-turned when it comes the way he supports Igbos and Biafra agitation this days and has never been known to mince his words, and those who choose to spar with him, have been known to weigh their options carefully. He has since shift his verbal war to the Imo State Governor, who lambasted the former Minister of Aviation in a statement released to the press yesterday. Chief Kayode slammed the governor in his statement, describing him as a frog, monkey and traitor of the Igbo people. Rochas Okorocha’s jibe at Chief Femi Fani-Kayode following the wide doubts expressed by Nigerians at the authenticity of the photograph emanating from the APC governors’ purported visit to Muhammadu Buhari in London is a sign of desperation to serve the evil purposes for which the Imo State governor has been procured. This is true to the character of Okorocha who is well known for his garrulousness which he ridiculously mistakes for oratory, with which, unfortunately, he has been misleading the good people of Imo State. 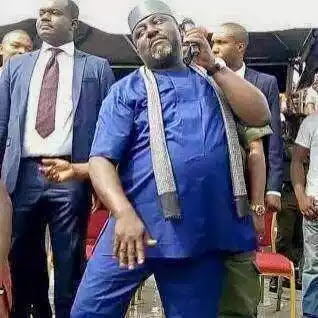 Okorocha is nothing but a dirty, cheap, fat, ugly frog that mistakes himself for a monkey simply because he can hop. A man who serves and defends a president and government that have murdered, insulted, marginalized and humiliated more of his own Igbo people than any other government in the history of Nigeria outside of the civil war. For a man whose party has unprecedentedly threatened to arrest the moment he steps out from the immunity he currently enjoys, Rochas should actually be hiding his head in shame when men like Fani-Kayode are talking. Uche Onyeagucha, an APC chieftain and a former member of the House of Representatives, has accused Okorocha of lying serially when he said he had spoilt Imo people with projects when in fact Rochas has only littered the state with a plethora of abandoned projects, most of which exist only on paper. “…Rochas should be in prison for the way and manner he has looted Imo State. He should rather be sewing his prison uniform. “At the appropriate time, Imo people will beam to the world, the many grisly misdeeds of this cruel administration… He has deceived our people for too long, he has bamboozled them with lies, and we have tolerated it long enough.” Need we say more? A man who deceitfully created a phantom Imo Air that soon disappeared into thin air without any notice after it was commissioned with so much pomp and circumstance does not deserve any serious attention. His deceit and cruelty has since been confirmed by Imo people, and his vicious credentials qualifies him for a regular mental check. The truth of the matter is that Fani-Kayode and Rochas are not in the same class. Imo people thought otherwise but today they know better. Our joy for them is that 2019 is just around the corner. They will surely kick him out, and his emptiness would be exposed. The truth that scares the likes of Okorocha is that Fani-Kayode is a confirmed Cambridge-trained lawyer whose great grandfather, Rev Emmanuel Adedapo Kayode, his grandfather, Victor Adedapo Kayode were UK-trained, and his father, Chief Remilekun Fani-Kayode, was not just a prominent lawyer who finished from Cambridge University in 1941 and came top in the British Bar examination for the whole of British Commonwealth of nations, he was also the Deputy Premier of Western Nigeria, and the one who successfully moved for Nigeria’s independence in the Federal House of Assembly in 1958. He was a Queens Counsel, the third Nigerian to be made a Senior Advocate of Nigeria, and set up the first indigenous law firm with the erudite late Chief Frederick Rotimi Williams and Chief Bode Thomas. One can go on and on. Chief Femi Fani-Kayode himself needs no introduction. A Cambridge trained-lawyer who was called to the Nigerian Bar in 1985, he practiced law in the firm of Kayode & Sowemimo before he ventured into politics where he rose to the peak of his career, becoming a two-time minister of the Federal Republic after being appointed the first ever Special Assistant on Public Affairs to the President of the Federal Republic of Nigeria. The import of all these is that Rochas has no history backing up his claim to fame today. He is alleged to come from an unknown root as his paternity is believed to still be very much in doubt even in Imo State. We know those who worship mammon and have sold their souls to the devil to acquire it and also to become governor. With time we shall expose their evil deeds including why they go about in customised diapers as a consequence of their evil and unnatural copulation even with donkeys just to acquire fame, money and power. One then wonders how such a man whose highest educational qualification is a mere Advanced Diploma would dare attack Fani-Kayode. A man that when you mention the name Williams Shakespeare to he would ask you if that is the name of his village barber rather than being one of the greatest literary minds and writer ever known in history. That is how primitive, uneducated and backward the walking statue is. If not for the kind of system that we run in Nigeria, men like Rochas should be seeking to write JAMB now in pursuit of their first degree. He probably would have been given admission now based on trial or pity because we know he has a very low intelligence quotient (IQ). Rochas should remember that he is a slave. If he was not a governor, FFK would have had him crawl on his knees and kiss his feet. He should know his place and stay out of our line of fire for his own good. In our own humble estimation, we think it is just too unfortunate that such a low life is leading an Imo State of erudite scholars, scientists, highly educated and successful businessmen/women, political giants, legal gurus etc. Our consolation, like Onyeagucha advised, is that Rochas Okorocha seemed to have attacked Fani-Kayode while sewing his prison uniform. The imagination of life after government house could have affected his mental state leading him to spew gibberish.